Theory of Change (ToC) explains your organization's intended path to impact by outlining causal linkages in an initiative (i.e., its shorter-term, intermediate, and longer-term outcomes). The identified changes are mapped in an “outcomes pathway” that shows the logical relationship and chronological flow between outcomes along the path to the desired impact. 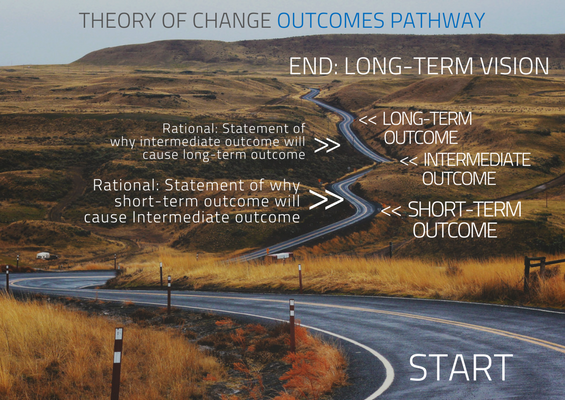 The links between outcomes are explained by “rationales” or statements of why one outcome is thought to be a prerequisite for another, and can be updated on the basis of evaluation evidence. For example, it has been assumed that improving the educational outcomes of children in a region will lead to the community’s ability to adapt to new agricultural practices when these children reach adulthood, thereby improving the yield of mint. This assumes that the children will remain in the region and working on farms. However, what if an unintended consequence of improved education was the loss of these young adults to higher paying jobs in urban regions thereby depriving the farming community of labour and skills? By exploring the theory of change of this project, we clarify the underlying assumptions and know what supporting evidence to seek at each stage to confirm that the project is on track to deliver the intended impact. 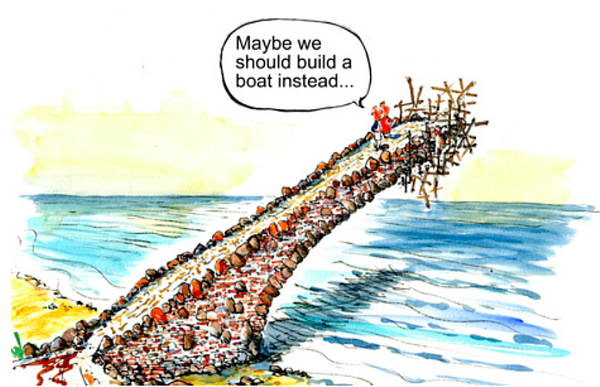 Is there a difference between logic model and theory of change? In general, both a logic model and a theory of change communicate how change is expected to be created. A logic model usually focused in on a specific program or intervention, mapping in a linear way how the inputs, activities, etc. lead to expected outputs and outcomes. It will contain less contextual elements (for example, of the problem being addressed) compared to a Theory of Change model. In short, they both show how an intervention will create impact results. The differences are in to what extent and where they focus. A Theory of Change is used at design and evaluation stages, while a logic model will be used for monitoring. A Theory of Change is usually presented as a diagram and accompanied with a narrative, while a logic model usually stands on its own (without a narrative) and tends to be a much more linear (while still diagrammatic) presentation. A Theory of Change will sometimes include information about the wider context of the problem being addressed, while a logic model sticks to simple mapping of a program's activities (from outputs to outcomes). With all this said, there is no completely standardized definition of one or the other, and many organizations use the terms interchangeably. This image from Tools4Dev demonstrates visually some of the key differences mentioned above. A Theory of Change (ToC) documents the change (impact) that you are seeking for both accountability and internal awareness of potential organizational challenges. In the ToC, the primary challenges indicated are your underlying assumptions. An assumption (no matter how strongly you believe it to be true) is, after all, an assumption. Woven into the fabric of every Theory of Change is at least one grand assumption. For example, that providing free shoes improves the overall quality of life. As we saw with Toms Shoes, an assumption that is not thoroughly explored can lead to negative consequences. In this case, in-kind donations replaced local markets and hurt the economy of the community served. 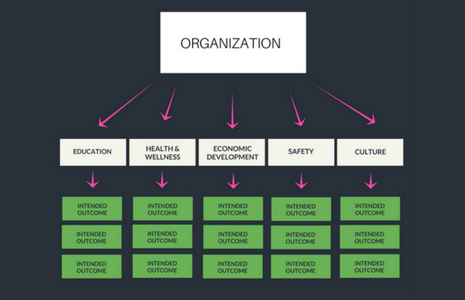 When researching Theory of Change you will quickly realize how complex it is. Mapping out the long-term path you intend to take in such a way that you surface the hidden assumptions is no easy task. There are hundreds of different examples of ToCs to build from along with thoughtfully constructed templates. How does the theory of change work? 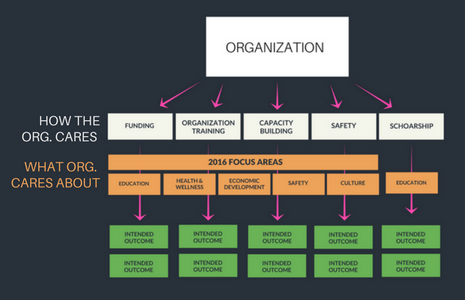 A theory of change is often visualized in the form of a diagram so that a change trajectory can be clearly shown. All the same, it is important to also communicate the thought process that the theory of change is built upon. A written "model" that complements the visual one, adding context and any existing data used as a foundation for the theory. Each step builds on the last you might have noticed, but each step is designed to inform the next. Skipping steps might lead to inconsistencies in the impact measurement strategy you are designing. You can use some of the templates provided in the Guidebook. There are some Theory of Change tools available and they can help in initial strategy. They do not have a complete data management thought process behind them so they only provide primary design. Why go beyond traditional ToC tools to advanced ToC driven platforms? Once you build ToC, next step is selecting Metrics. It will become complicated when metrics have to be aligned with standards just as SDGs, IRIS, BOND etc, collect data, analyze, get insight and report. SoPact Impact Cloud has introduced a freemium version of a theory of change application that allows any mission-driven organization or sustainable business to build a step-by-step impact strategy with a faster path towards a robust data-driven impact journey to follow. Unlike many theory-of-change-based software or tools, Impact Cloud is the fastest way to build an overall impact strategy and to start a data-driven impact journey. The Center for Theory of Change, a non profit organization dedicated to promoting best practices in ToC, has created a valuable database of existing Theory of Change models from organizations around the world. If you are working within a designated community toward its general improvement, you face some unique challenges when formatting your impact framework. You may find that the internal politics of funding plays a particularly prominent role within such a condensed environment. You might also find that your organization’s focus areas are fluid, and occasionally being stretched to incorporate an organization who’s scope rests outside the main categories. Maybe you’re not worried about your program structure. After all, what’s the use of a well-defined program structure? Well, it all boils down to impact communication. Your organization's program structure is a blueprint of your organization’s impact identity. Program Structure is one of the first activities of Actionable Impact Management, found in Volume One: Groundwork. Turns out the structure of programming is not a one-size-fits-all. This is especially true of organizations with a fluid set of focus areas. Community foundations, impact funds or impact investors who focus on place rather than issue area all have a similar problem when it comes to the program structure outlined above. Namely, that it does not account for their Vision and Mission. Your goal is to strengthen a community – not further education or safety. This helps to remind your staff, board and advisors of the scope of activities performed by your organization while also embedding the focus areas that represent the intended community impact. Once you have defined complete program structure, you can start building theory of change of each programs. For each program, it is important to realize a common indicators that can allow organization to define aggregate results. While there is a relative consensus that impact management is critical to impact investing, mission-driven organizations tend to focus more on "impact measurement" than management. To have good impact measurement it is essential to have systems, tools, and resources in place to manage impact at all levels. The primary driver for impact management is to ensure investees or grantees better understand the social and financial effect of their product or services. In short, this helps encourage accountability to the Theory of Change of an organization and/or a funder. Strong impact management also enables these actors to better align high level outcomes with lower level, and drive impact learnings at the funder level. Collaborative impact management, for example when investors help investees improve their data management capacity, can help improve impact outcomes for both stakeholders. Investees are able to make better data collection decisions which will eventually inform important management decisions. The distinction between expected impact and realized impact. It is important to have normative benchmarks for impact performance to help set realistic expectations and compare with the actual. The relationship between aggregation and financial incentives. Aggregation across asset classes and attribution. The incentives, financial and otherwise, around all of this are key. If there is a (perceived) risk on the management team’s part that a stakeholder group will get pissed off if you engage them about their experience, they are generally wary of doing so unless there are perceived benefits of doing so (which may be in the form of encouragement to learning from board members). Data collection has cost implications and thus requires some decisions upfront. We need to define who the consumers of the data are and what their interests are; we also need to determine what we want to influence and how we will do that. The challenge is in how we balance, prioritize and respond to all these data requirements at the same time. There is a lot of discussion about cost. But it is important to realize that the intended benefit of defining outcomes is not necessarily that you have an accurate accounting but that you are creating accounting for the organization by working with beneficiaries. Engaging them properly and having a system that properly understands the needs of beneficiaries will help improve overall outcomes for all involved. The world we are moving into is one that is not accepting the notion that all good efforts lead to good impact. Although this new ideology challenges our organizations, efforts, and projects, it brings with it accountability, transparency, and reform. If we are prepared, we can be a part of the shaping of this new era. Before moving forward, be sure to gain the trust and backing of your stakeholders. Be sure that there is collective organizational intention to take the activities seriously. You will need to work together – from the Executive Director to the program coordinators to the interns to the Board. Fair warning, once you have completed your new impact measurement strategy and you are ready to implement it in your organization, you might find some resistance from your colleagues. This is natural; people have a natural fear of change. Breaking the status quo brings uncertainty and anxiety. Before you embark on this journey to improve your impact measurement strategy, know that it will require change…in your organization’s mindset, in your operations, maybe even in your tools and technology. But if you succeed to engage your organization in this journey, the results will be amazing. Here are some tips to achieve the level of involvement that you require in order for your organization to succeed. Invite key stakeholders to be part of the preparation, especially those affected by or driving the changes, i.e. leadership, program managers, etc. 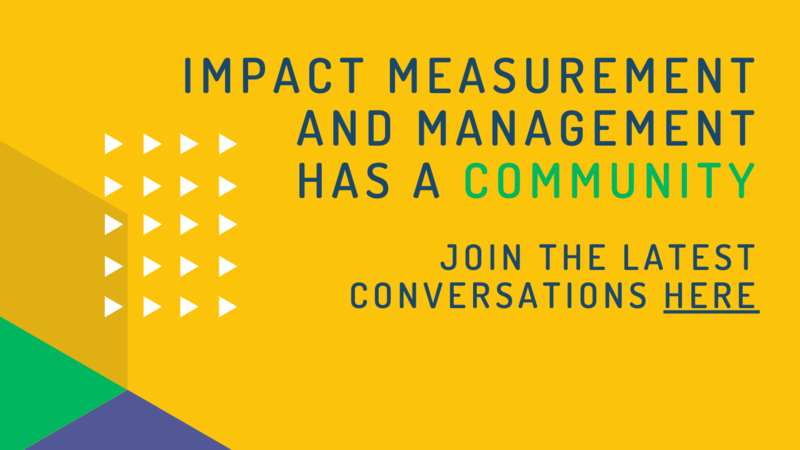 Communicate your intent to implement or improve the impact measurement strategy. In the beginning, this might be done through information sessions open to anyone interested in learning more about the new impact measurement process. Remember that people are motivated by the outcome. Be sure to expose the need for change to the whole organization and clearly describe how the change will benefit each area of the organization. Don’t try to boil the ocean – start small. A small change is easier to control and observe the results. As you go along, small wins will motivate staff. 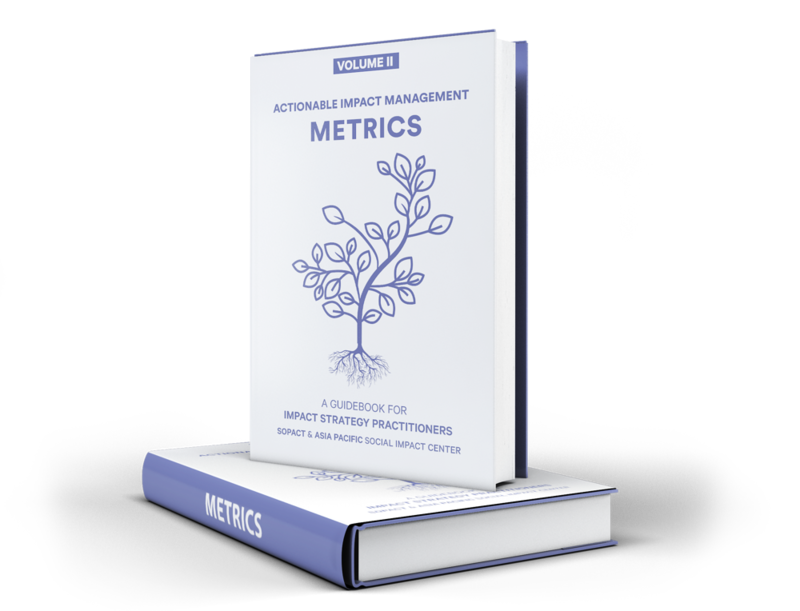 In this case, you might go by Volumes: The Actionable Impact Management framework is already broken into 4 steps (Groundwork; Metrics; Data; Impact Report) that might serve as a reasonable guideline for your organization’s bite-sized chunks. Identify the early adopters within the different departments – the individuals that seem most excited about the potential change and who want to be part of it. Next, provide those individuals with training so that they are well-versed in the objectives and goals along with the methodologies and tools that will be used to apply them. Throughout the process, these are the individuals you will want to keep informed and updated. They will help keep everyone else updated as well. Be sure to listen to their feedback. All this feedback will help you make small adjustments to make the change smoother. Recognize those making the effort to adopt the new process. Show how the benefits are starting to happen. Communicate how this new impact strategy is helping your organization, either in terms of efficiency, effectiveness or any other element that is relevant to your organization’s culture. Try to adapt the implementation process around the organic inclinations of those involved. Well thought out technology tools can make the process a lot simpler and easy for stakeholder engagement. Using multiple tools which are not made for impact data management can be very time consuming and resource draining in long run. The following list contains most useful and researched theory of change resources. Start your impact learning here!